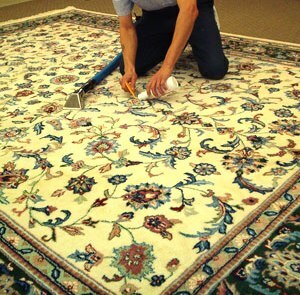 Canberra rug cleaning service will clean all types of rugs such as Persian, Oriental, Indian, Chinese, Silk, Wool or Synthetic. We will work hard on giving a residential or commercial rug a thorough clean that will help bring back its almost new appearance, maintain its wonderful condition and make it last for a much longer period of time. Our skilled and professional technicians will efficiently remove surface dirt and grime, as well as harmful pollutants or allergens build-up underneath the fibers. We aim to offer our clients only the best, reasonably priced rug cleaning job that is backed with a Satisfaction Guarantee. We employ the most recent and powerful equipment together with s mild solutions to successfully remove harmful contaminants accumulation, stubborn stains and odor-causing bacteria deep down the fibers that are normally impossible to get rid of with just regular vacuuming. Our service also includes restoration and re-fringing works to offer customers with a complete professional cleaning program that will no doubt bring outstanding results. Giving rugs a professional, thorough clean will no doubt make them look lovelier, become much cleaner, healthier, smells fresher and last longer. Contact us today and schedule our rug cleaning service.